Gerald Wendell Johnson, son of Samuel Clyde and Vera (Lantz) Johnson was born on his parent’s farm near Van Wert, Iowa on January 26, 1923. He died November 25, 2014 in Chillicothe, Missouri at the age of 91 years 9 months and 30 days. In 1941 Gerald graduated from High School in Osceola, Iowa. He worked for Iowa State Agriculture School until he enlisted in the Merchant Marines in March, 1943. He married Gloria Bennett in Osceola, Iowa on September 17, 1943. He was then transferred to the Army Transportation Service where he finished his tour of duty in 1947. To this union three sons, Stephen, Stuart, Stanley, and one daughter Lorraine, were born. After working a few years for the Natural Gas Pipeline, they moved near Van Wert, Iowa in 1952 to start farming. After retiring in 1977, they moved to Warsaw, Missouri and enjoyed many years. In 2006 they moved to Chillicothe, Missouri to be near family. He attended The Pleasant Grove Methodist Church. His greatest pleasures in life were farming and spending time with his family and friends. 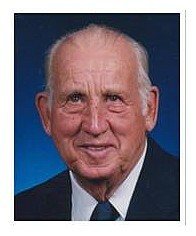 He especially enjoyed taking time to teach his grandchildren how to fish, go boating and how to enjoy life. He was preceded in death by his wife Gloria, son Stephen, Grandson Lucas, parents, brothers Willard and Robert Johnson, sister Twyla Eddy, sisters-in-law Etoile, Betty and Beverly Johnson and brother-in-law Olin Eddy. Gerald is survived by his children Stuart and Joyce Johnson of Thurman, Iowa; Stanley Johnson of Atlantic, Iowa; Rick and Lorraine Hartley of Chillicothe, Missouri; daughter-in-law Phyllis Johnson of Dillsburg, Pennsylvania; grandchildren Jeff and Lori Johnson of Glenwood, Iowa; Dan and Amy Deike of Indianola, Iowa; Erin Johnson of Indianola, Iowa; Quinn and Molly Johnson-McCormick of Marion, Iowa; Ryan and Lisa Hartley of Clarinda, Iowa; Dan and Sally Johnson of Phoenix, Arizona; and Nathan Hartley of Olathe, Kansas; granddaughter-in-aw Stacia Johnson of Vinton, Iowa; eighteen great grandchildren, several nieces and nephews; cousins; other relatives and friends.